With the new year I’ve been yearning for even more color and pattern in my life! When Home Decorators invited me to feature some of their beautiful bedding for their Annual White Sale I thought it would be the perfect opportunity to kick things up a notch in our master bedroom. 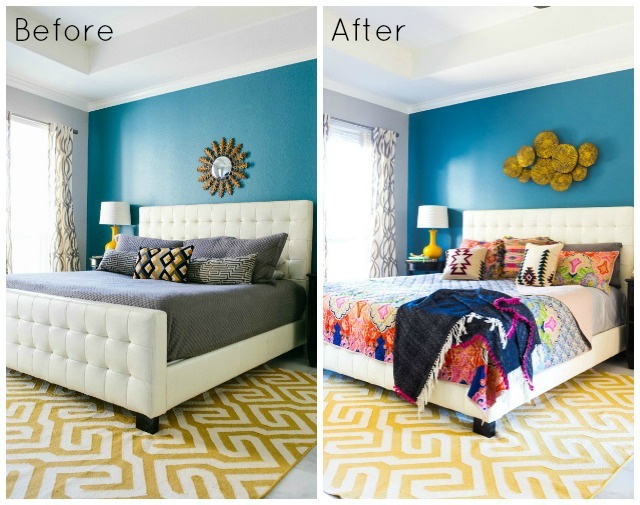 It is amazing how you can completely change the look of a bedroom by the bedding alone. While keeping the wall color, furniture, lamps, and rug the same I was able to transform our bedroom into a colorful, cozy boho chic oasis! Even though I liked our master bedroom before, it had been that way for a few years and I was looking to mix up the style while keeping the furnishings the same. 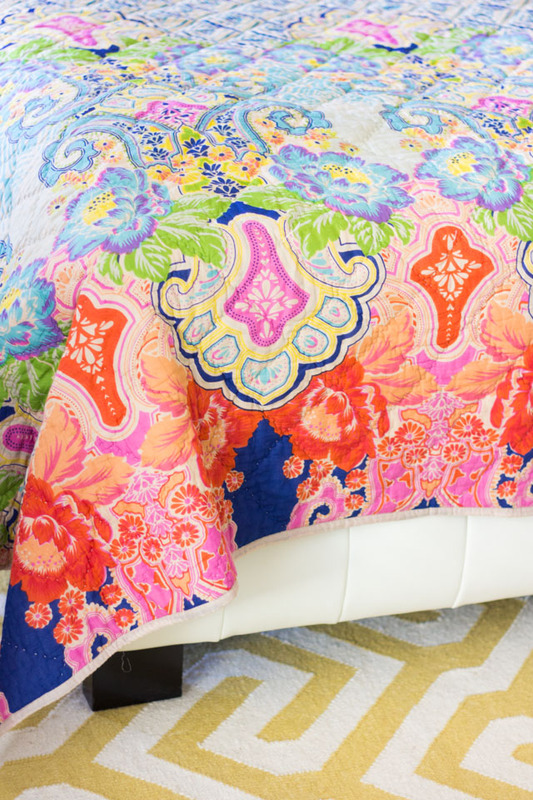 This Glenneyre Quilt with its bold mix of colors and patterns was the first thing that caught my eye on the Home Decorators site and it was what inspired me to go from modern and streamlined to a more free-flowing bohemian look. 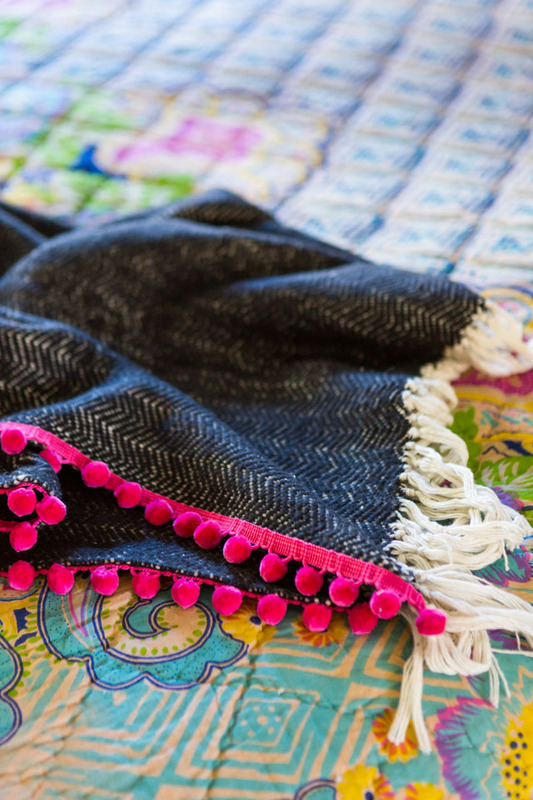 Bohemian, boho, or boho chic style – whatever you like to call it – can take on a variety of forms, but one thing you’ll almost always find in a boho style bedroom is an eye-catching quilt or comforter on the bed. 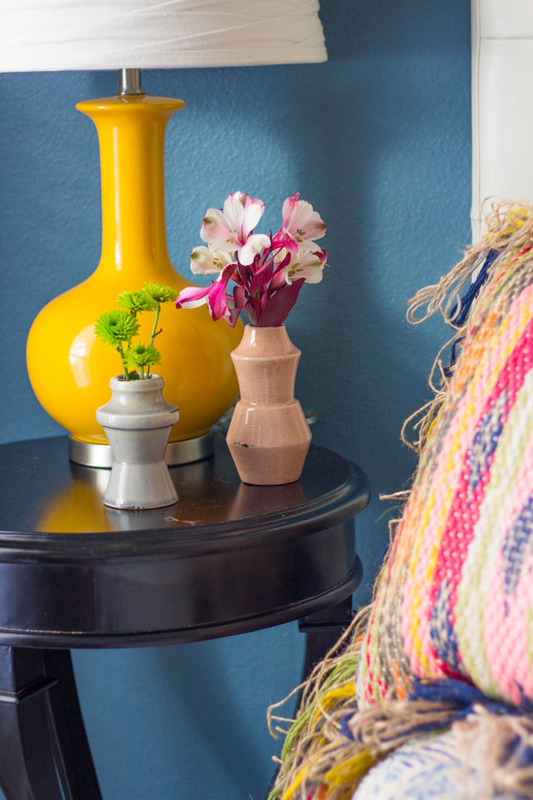 This is your chance to set the color palette for the room, so make it a bold one! The Glenneyre Quilt has so many different colors, you can choose which ones you want to further accentuate through different decor pieces around the room. 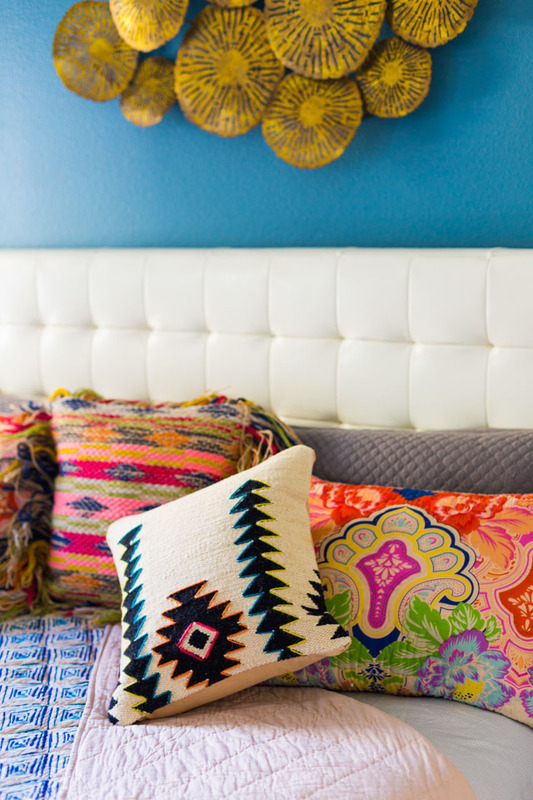 You can never have too many accent pillows in a boho bedroom! I chose the Glenneyre Shams to match the quilt, but then also had fun layering in some Woven Wool Kilim Pillows and this unique Aztec Boucle Fringe Pillow. 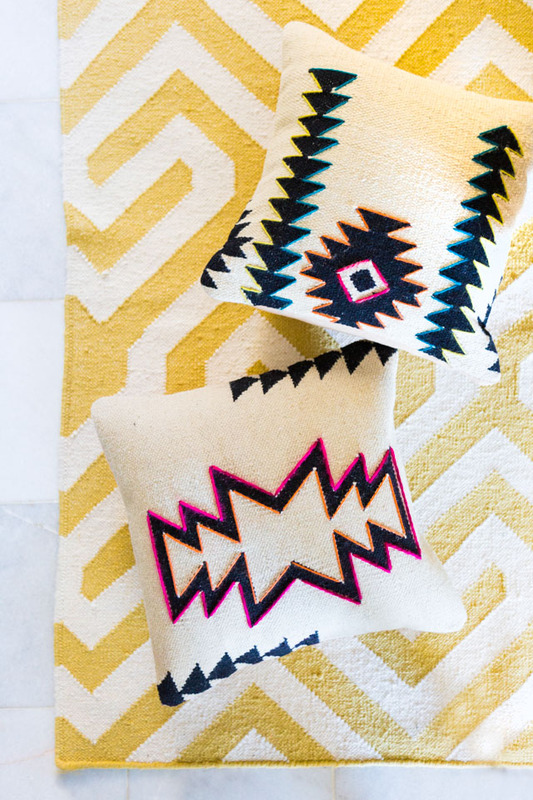 Boho style allows you to mix designs from around the world, like the Turkish influences of the kilim pillows and the Southwest style of the boucle fringe pillow. 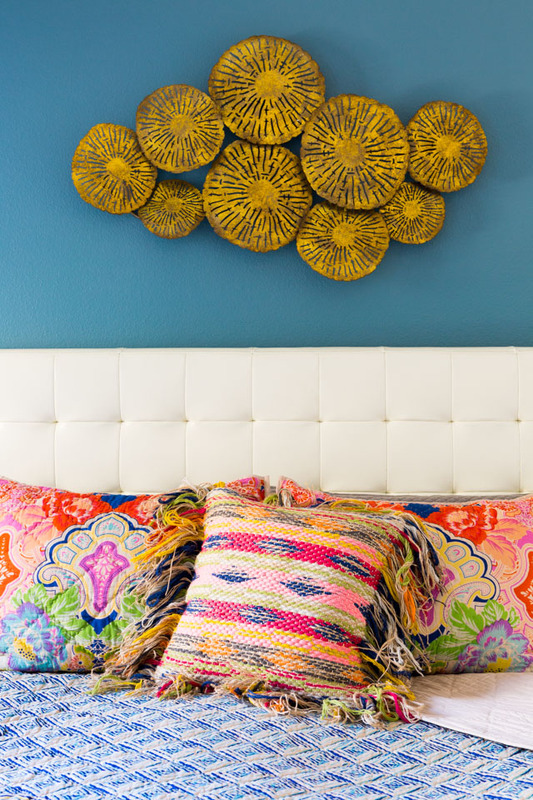 The pillows are a great place to start experimenting with different textures and patterns, but you can also layer in a soft throw on the edge of the bed, a sculptural piece of art, or natural woven baskets. 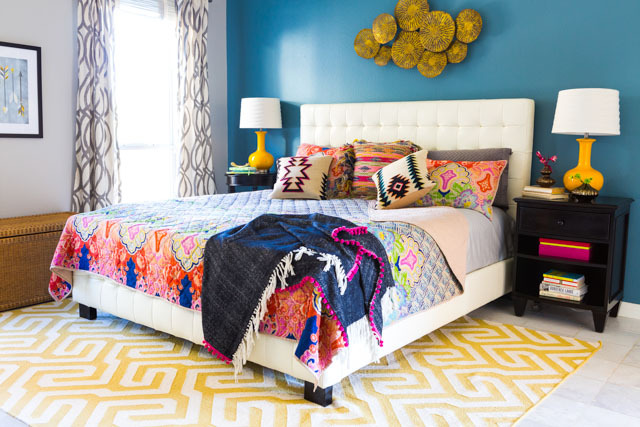 Our rug already had a bold pattern so I looked for bedding and pillow patterns that would play well with the rug. 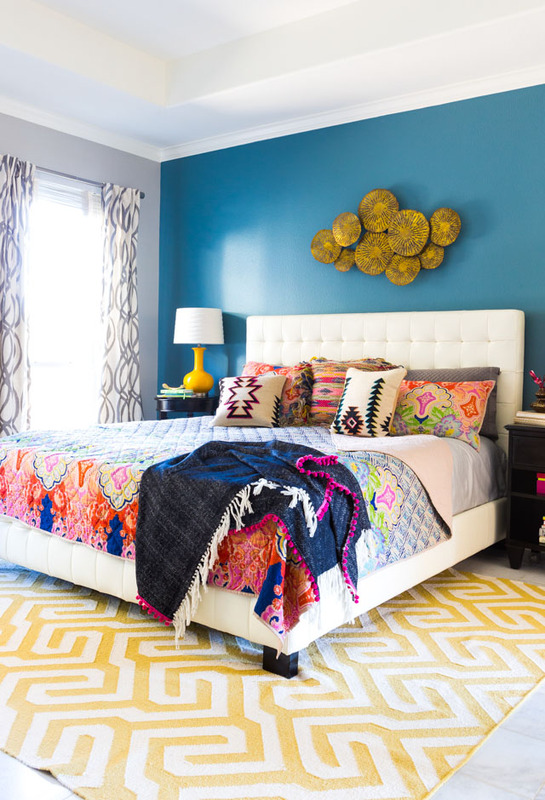 The trick to mixing patterns is varying the size of the pattern (such as the intricate floral pattern of the quilt paired with the big geometric pattern on the black & tan kilim pillows), but finding a way to tie them all together. 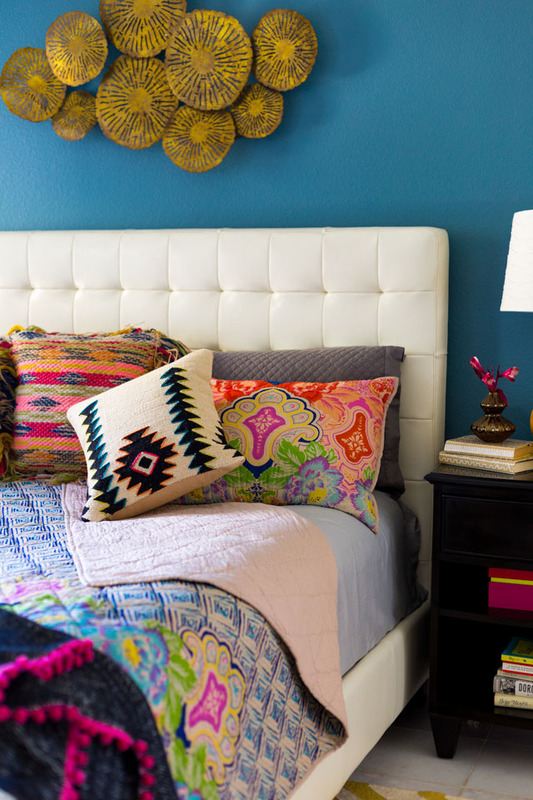 I used a little DIY embroidery to help coordinate the pillows with the colorful bedding (see below!). I’m no embroiderer, but this is as easy as it gets! Just remove the pillow insert and thread a length of yarn through a darning needle. 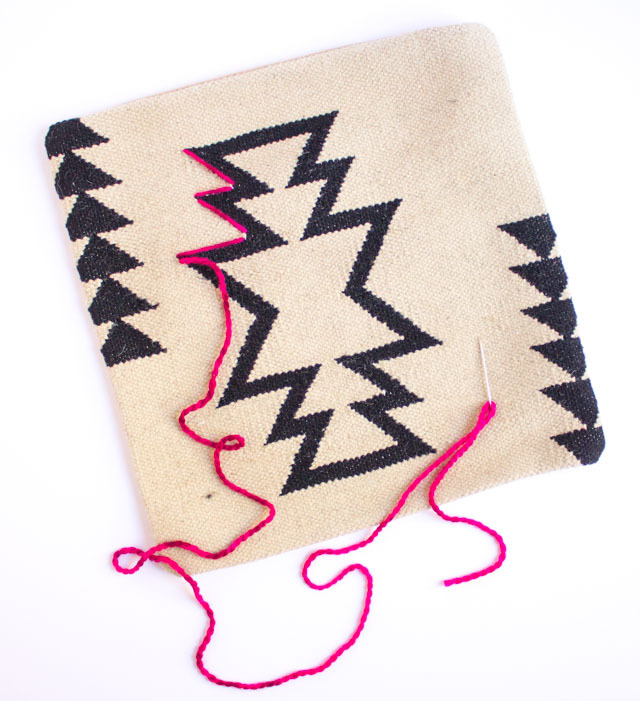 Stitch around the design by making long stitches. So easy! 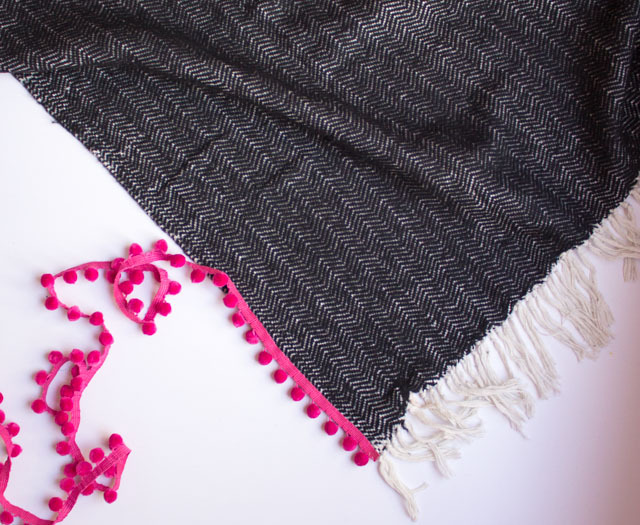 I added a pop of color to the black herringbone throw by running a length of bright pink pom-pom fringe down the side! To add the fringe, I just ran a bead of fabric glue down the long edge of the throw and then pressed the fringe down into the glue as I went along. I repeated on the other long side of the throw and it worked great! If you have a sewing machine at home, you can also run a stitch through the trim. For a final touch I switched out our sunburst mirror for this pretty metallic Atzi Wall Sculpture. It has that global look that works well with the boho style. Some greenery – whether a couple overflowing houseplants or a vase of colorful flowers will always look at home in a boho room! These pretty nesting vases are the perfect small size to put on a bedside table and come in a set of 5 different colors and sizes. That’s it! I officially accomplished adding a lot more pattern and color to our bedroom (and my husband was kind enough to go along with it!). If you’re looking to change up your bedroom, start with the bedding first. You might be surprised just how different the space can look without investing in new furniture. Don’t miss Home Decorators’ Annual White Sale, going on now through Feb. 6. All bed and bath linens are 20% off + free shipping! This post is sponsored by Home Decorators Collection. Photos by Candice Stringham.